The Axolotl is unusual in nature because it retains its larval form into adulthood. In fact, it becomes sexually mature in this state. This adaptation, known as neoteny, is often viewed as a backward step in evolution because it prevents the axolotl from living on land, and as a result, it can't colonise new habitats. However, it has led to the axolotl being quite successful in its native habitat, at least until the arrival of man. The Axolotl is carnivorous and has reasonably typical internal carnivore anatomy, with the main exception of the teeth. Its teeth are pedicalate (i.e. they're small stumps, like cones). With these it grips its food, manoeuvering it into position before swallowing it whole. It has a three-chambered amphibian heart (unlike the mammalian four-chambered heart), and, like all amphibians, it is poikilothermic (its body temperature is dependent upon its surroundings). One thing to note is that although they retain larval morphology, they do develop rudimentary lungs, and axolotls can be seen to occasionally rise to the surface, take a quick gulp of air to fill these lungs, and then quickly descend to the bottom once more. From my observations, I believe that the lungs develop shortly after the rear legs reach their full length. Axolotls are famous for their fabulous regeneration ability. Regeneration studies carried out around the world often involve the Axolotl. For example, a young axolotl that loses a foot to a sibling will usually grow it back over a period of a few weeks. This regeneration occurs via the formation of a "bud" at the end of the damaged appendage, followed by growth of the new foot. Entire limbs can be regenerated and even portions of the brain and spine. The diagram on the right is a summary of the development of the Axolotl, from egg to adult. The red line below each animal represents roughly 2 mm. The egg (stage 1) is typically amphibian. It comprises of the embryo, which measures about 2 mm in diameter, and also the surrounding layers of jelly. The jelly is the product of water and a substance that is secreted around the egg when it is laid. Stage 2 is the embryo prior to hatching. At this stage it is approximately 11mm in length. Stage 3 is the young larva, prior to the growth of limbs. Larval axolotls tend to be transparent for their first few weeks of life, or until the skin has thickened and pigment cells have proliferated over the body, so the organs are quite visible, as well as the progress of any food in the digestive tract. After approximately two weeks, the larva reaches stage 4. Like all other caudates (newts and salamanders), and unlike anurans (frogs and toads), the front legs develop first, followed within a few weeks by the hind legs. At stage 5 the axolotl is, to all intents and purposes, a miniature adult. I once saw a friend's female axolotl that was about 43 cm (17 inches) in length. However, a large size for most axolotls would be 25-30 cm (10-12 inches). The average seems to be about 23-25 cm (9-10 inches). Adults tend to reach their full size after eighteen months to two years, the growth rate depending on how well they are fed and at what temperature they are kept. I've raised axolotls to 26 cm in 7 months, but that's exceptionally fast. The two pictures on the left and right are of a young adult female (hence the lack of eggs which would normally give the female a much more rounded appearance). Notice that one of her gill branches is held in a different orientation to normal (the gill on the left actually). 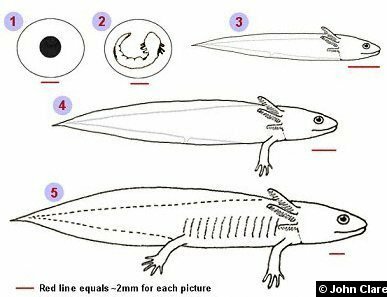 I have redrawn the diagram in Peter Scott's book (see Books and Links) of the Axolotl's digestive system on a real axolotl, in order to better illustrate the proportions and help us to visualise the internal arrangement of the organs. Imagine you're seeing through the animal. The cloaca/vent is on the underside. Male and female axolotls differ in a number of ways. Peter Scott gives a few pointers, but some of these seem to be rather inaccurate and unreliable. There are only two reliable methods of distinguishing males from females. The first is that mature females tend to have very rounded bodies, due to the number of eggs present in their bodies. And the most reliable is that the sexually mature male's cloacal region is swollen, while that of the sexually mature female is considerably less so. See the photos at the bottom of this page. Males generally reach sexual maturity slightly earlier than females, and mature males tend to be more elongated, and longer tails than females. One point of note is that white, golden, and albino axolotls that have reached sexual maturity will have dark brown tips to their toes. The soles of their feet may even appear "dirty" (see the photo below). 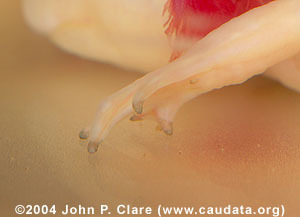 In wild type and melanoid animals the toe tips become slightly paler than the rest of the body, at maturity, but it is harder to see than in the lighter colour variants. Male axolotls go through a cycle where, although sexually mature, they may not have sperm available for mating. In the wild this seems to be determined to some extent by the seasons. However, in captivity it's less regular and may occur at any time of the year. It usually takes the male about 2-3 months to produce sperm and perhaps a further 2 months for the sperm to move into the vas deferens so that it is available for mating. This could mean that the overlap between having and not having sperm available could be a few weeks to a few months. Dark toe tips on lightly coloured axolotls indicate sexual maturity. The first photo below is of the cloacal region of a mature male and the second is of a mature female's cloacal region. The male is a golden albino, while the female is a melanoid albino. Their cloacas are circled in blue. Axolotls occur in a number of colour variants too. This subject is discussed on the Genetics Page. The Health Page covers axolotl ailments.